Hi, I am interested in your 1996 BMW Z3 (stock #4843-CHA) listed on Autotrader for $6,995. I'd like to get more information about this vehicle and confirm its availability. After an 18-year hiatus, BMW has revived the 8 Series name with the BMW Concept 8 Series. The automaker's new flagship model could help the manufacturer compete against Mercedes-Benz, which overtook BMW last year as the world's largest luxury automaker. Heres an opportunity for luxury and precision that goes well beyond the value price. 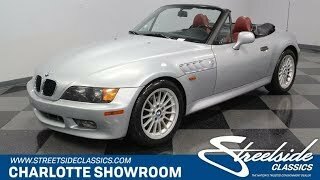 This 1996 BMW Z3 offers a sporting chassis, five-speed stick-shift, and plenty of modern luxury features that youd expect from a premium marque. This is the first full model year that launched the now legendary Z-line of roadsters. BMW created instant desire with the long hood, short deck, and extra-wide fender flares that instantly convey a car meant for driving. You can tell they spent time on the details of this design with how well some of the pieces were integrated right at the factory. Features like the ground effects, side louvers, and third brake light are part of a premium look that was instilled from day one. German luxury is best shown on a timeless color like silver with a coordinating black folding top. But any time you want to show this Z3s wild side, just take the roof down. Red leather always looks fantastically aggressive while never spoiling a luxury image. This mix of sporting and comfort is what a Z3 is all about. The dual bucket seats power adjust to strike that perfect balance between sports car contouring and grand touring comfort. You get a ton of great feature packed into this BMW. It includes power windows, powers locks, cruise control, power steering, dual front airbags, and a powerful AM/FM/cassette stereo with CD changer. BMW engineered the roof to stow away quickly and cleanly. Since they are encouraging top-down motoring on a whim, youll be happy the air conditioning is blowing nice and cold. Under the hood is the correct 1.9-liter engine. This fuel-injected DOHC motor takes advantage of the great European tradition of lower displacement motors that love to rev for the true performance feeling. This is especially true on this five-speed manual transmission example a rare feature that really allows to take full control into your hands. The fully-independent suspension seems to have mastered the right blend of performance and comfort, like a good BMW should. Powerful four-wheel disc brakes with standard ABS complete this confidence-inspiring package. Heres a premium roadster with a great history and an affordable price. This is a terrific recipe for open road enjoyment, so dont miss out. Call now!